Mouse CD47, Mouse IgG2a Fc Tag, low endotoxin (CD7-M525a) is expressed from human 293 cells (HEK293). It contains AA Gln 19 - Lys 140 (Accession # Q61735-1). The protein has a calculated MW of 40.7 kDa. The protein migrates as 55-85 kDa under reducing (R) condition (SDS-PAGE) due to glycosylation. 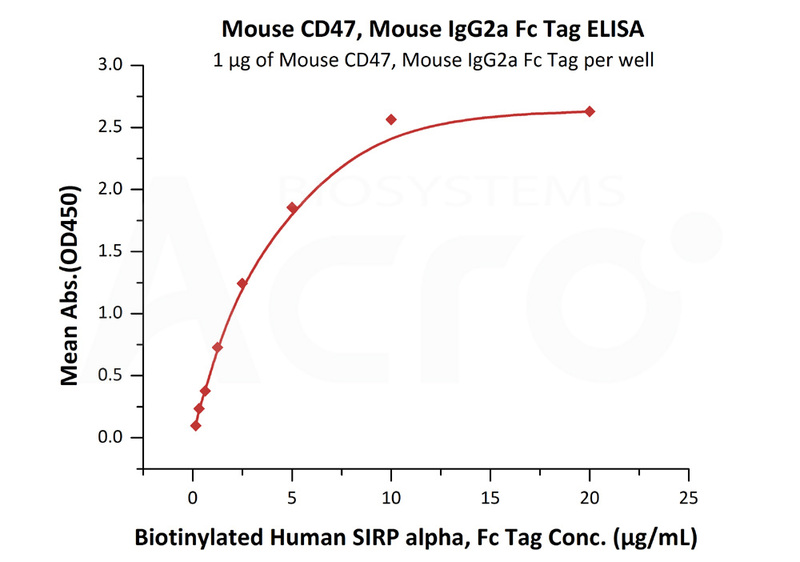 Mouse CD47, Mouse IgG2a Fc Tag, low endotoxin on SDS-PAGE under reducing (R) condition. The gel was stained overnight with Coomassie Blue. The purity of the protein is greater than 95%. Immobilized Mouse CD47, Mouse IgG2a Fc Tag, low endotoxin (Cat. No. 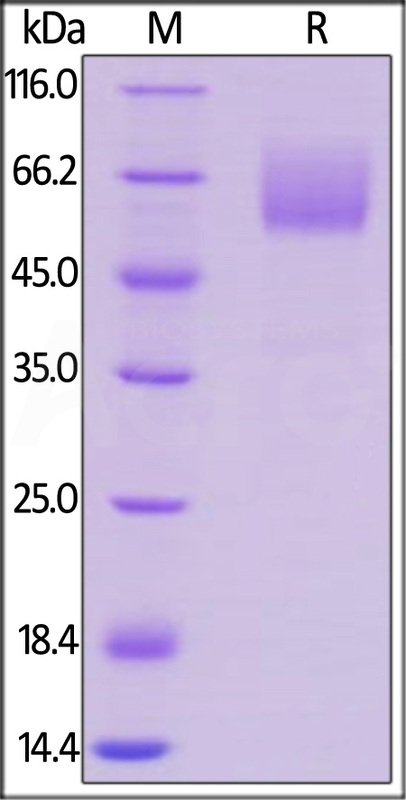 CD7-M525a) at 10 μg/mL (100 μL/well) can bind Biotinylated Human SIRP alpha, Fc Tag (Cat. No. CDA-H82F2) with a linear range of 0.16-5 μg/mL (QC tested). Leukocyte surface antigen CD47 is also known as Antigenic surface determinant protein OA3, Integrin-associated protein (IAP) and Protein MER6. CD47 contains 1 Ig-like V-type (immunoglobulin-like) domain. CD47 is very broadly distributed on normal adult tissues. CD47 has a role in both cell adhesion by acting as an adhesion receptor for THBS1 on platelets, and in the modulation of integrins and plays an important role in memory formation and synaptic plasticity in the hippocampus by similarity. CD47 is the receptor for SIRPA, binding to which prevents maturation of immature dendritic cells and inhibits cytokine production by mature dendritic cells. CD47 Interaction with SIRPG mediates cell-cell adhesion, enhances superantigen-dependent T-cell-mediated proliferation and costimulates T-cell activation. (1) Lindberg F.P., et al., 1993, J. Cell Biol. 123:485-496. (2) Latour S., et al., 2001, J. Immunol. 167:2547-2554. (3) Piccio L., et al., 2005, Blood 105:2421-2427.